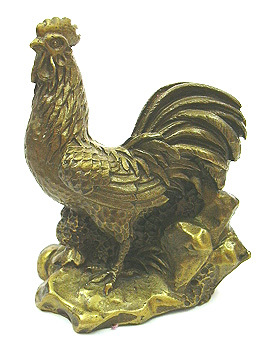 This is a bronze rooster specially made with characteristics that is needed for Feng Shui potency. It has a solid crown on its head with a well shaped beak. Its tail is also attractive and showing off its masculinity. Its gesture is firm, confident and fierce to counter office politics, biz competitor and 3rd parties in relationships. It could also boost your fame luck and authority for the patriach. This rooster as shown in the picture is designed to impress. The artwork is detail and fine. 1. Rooster will help to solve political problems in office, backstabbing, arguments and harmful peers when placed on your office desk. For modern offices that have cubicles that resemble a centipede arrangement, place the rooster on the boss' desk to kill the centipede that causes quarreling, havoc and irritation in office. 3. For married couples, you should be proud if your spouses are attractive. But you should also cautiously prevent centipede third party from affecting your relationship. Place a golden rooster facing outwards at the maindoor to prevent your spouse from being snatched away.